Click images above to view more information. Is your family trying to manage an ongoing dispute around eldercare, family property, estate planning or inheritance issues? Is your family conflict causing distress for your elderly parent? Do you love your siblings but have no idea how to get them to communicate and make decisions? If your family is experiencing these or any other all too common adult family challenges, this guide is for you. Mom Always Liked You Best is designed to give you the information and tools you need right now to achieve those mutual agreements that seem so elusive. Our goal is to help you lead your own family members toward consensus around some of the most important decisions you will ever face together. We all experience family conflict. This guide can help you achieve family peace. Kardasis, A., Larsen, R., Thorpe, C., & Trippe, B. (2011). 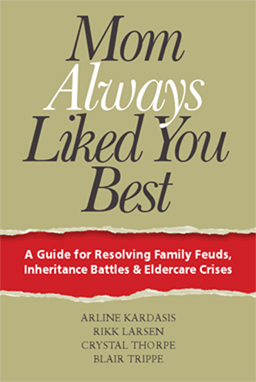 Mom Always Liked You Best: A Guide for Resolving Family Feuds, Inheritance Battles & Eldercare Crises. Norwood, MA: Agreement Resources, LLC. Co-authors Rikk Larsen and Blair Trippe were featured on WGBH’s Greater Boston with host Emily Rooney on August 1, 2011. View the interview, above.